I started visiting the Welsh border area in the mid-1980s, an exercise in visiting the ancient home of the Whitneys at Whitney-on-Wye, Herefordshire. Several years later, Mary Ann and I rediscovered Nevil Shute ("On the Beach" was required reading for us in the Cold War years of the late 1950s in the USA). However, only recently, did we learn of a connection between Barnes Wallis, Shute's senior on the R100 project, and the Welsh border area we've been enjoying for almost 25 years. In the old grounds of a Herefordshire country house two squat, apparently unexceptional bungalows are up for sale. Built before the war, moss has settled on their roofs and the paint of their white-washed exteriors is peeling. Tomcats prowl at dusk in the shadow of the crumbling water tower which used to service the properties. When you push open the front doors a tiny flurry of moths escapes. Inside, the rooms are empty and cool and in the case of "Longhills," the first bungalow well proportioned. You expect the same to be true of "Castleton," the second - there is a little community of four or five altogether - especially with its carefully tended gardens. It is not. "Castleton" is the joker in the pack. Irregular wall patterns tend to shut out the light, and long, narrow, gloomy rooms with off-centre windows betray an institutional almost chamber-like construction. A vast double garage comprising half the building seems strangely top heavy and outside again you might begin to notice how ranks and tangles of trees shelter, almost conceal, the spot. The house is Winforton House, Winforton, in West Herefordshire. The "bungalows" are the former Herefordshire headquarters and laboratory of probably wartime Britain's most important and least known scientist: Sir Thomas Merton KBE. On the old Ordnance Survey maps they are referred to as "The Laboratories". Until now the facts of the extraordinary life of this MI5 scientist, gifted inventor, art connoisseur and friend of the likes of Churchill and Barnes-Wallis, have either remained undisclosed or have been gathering dust on the bookshelves of specialist libraries. As the anniversary of The Battle of Britain passes, how many people realize that it was a Herefordshire man whose inventions helped engineer eventual victory? And most military experts agree that had the Battle of Britain been lost, a Nazi invasion of mainland Britain in 1940 would have been little more than a formality. Perhaps it is in keeping with Merton's elusive character, that he has been left out in the cold, while his peers have basked in the glow of their own cathode rays and become household names. 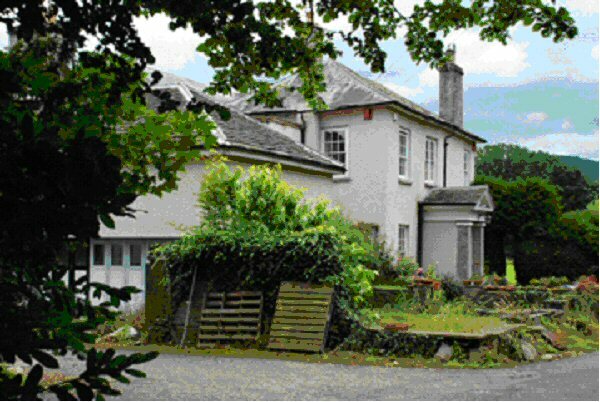 In 1923 a wealthy Oxford professor, Dr Thomas Ralph Merton FRS bought the Winforton Estate, Herefordshire. The estate included Winforton House and a three mile stretch of salmon fishing on the Wye, to which he soon added his own private laboratory in the house's grounds, "camouflaged" by the little village of servants' bungalows that surrounded it. Though his major achievements were yet to come, Merton had already distinguished himself in the First World War - in MI5. 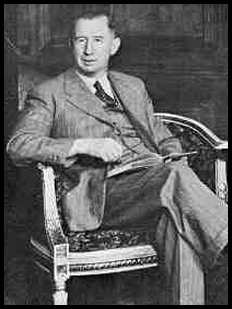 Asked personally to join by General Sir Frederick Browning, Merton was the first scientist ever employed in the Secret Service and operational, under Commander Cummings "C", he first cracked the secret writing used by German spies and then himself invented a new secret coding for British agents. Merton's inventive genius might have remained largely hidden had it not been again called into action with the approach of World War II. And it was a lab at the bottom of a Winforton back garden (admittedly a rather grand one) which was the womb for four major inventions that contributed so much to the defence of Britain, and for which Merton has received so little public recognition. When Merton was at work, the lab was strictly forbidden territory for all but his assistant Frederick Morris. But Margaret Holland, head housemaid at Winforton 1935-41, and John Evans, whose father was Merton's chauffeur, couldn't resist snatching a look. "Castleton" then had its own darkroom, red tiled floors, tables and desks, and was littered with bits of metal and machinery. John remembers watching Morris - a tall, thin, silent man - glassblowing. It was in this lab, "somewhere in Herefordshire", that Merton, a member of the Air Defence of Great Britain Committee, originated the long persistence radar screen which helped save the country in The Battle of Britain. Characteristically he has received little credit for this because a year later someone else came up with the same idea - and won the patent. Later Merton discovered that by using a special gas the speed of fighter aircraft in battle could be accelerated by 45 mph - a tremendous increase for the planes of the day. With the aid of his friend Sir Stafford Cripps, it was adopted and the discovery came just in time to counter Hitler's flying bombs, the "doodlebugs." There is something of the mythical garret boffin about Thomas Merton; as a schoolboy he had a fully equipped lab at home. And his range finding device which enabled fighter pilots to find the optimum distance for destroying flying bombs - not too close to be blown to smithereens and not too far away to be innocuous - shows this more than most. Appointed chairman of the committee whose brief was to scientifically combat the flying bomb Merton produced the diffraction range finder in his Winforton lab, in only 24 hours. He later referred to it as a "simple device." Simple or not Sir Thomas' "device" repelled the "doodlebugs." The record bag was on August 24 1944 when out of 101 flying bombs approaching the English coast, 97 were brought down. Merton was also responsible for a black paint reducing the light reflected from bombers in a searchlight, to less that one per cent. Again with total humility Merton said: "This was after some opposition, adopted and must have saved a good many lives." Before and during the war, Winforton House became a great centre for the Mertons many scientific friends and a rendezvous for the leading figures of the age. 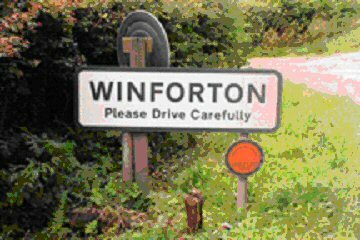 In 1935 a certain gentleman name of Winston Churchill and his wife, come to Winforton. Merton's eldest son John painted a portrait of Sarah Churchill while the inventor and future Prime Minister shot game in Winforton Woods. Secluded and comfortable, scientists Knights including Harold Hartley, Henry Tizard, Ronald Ross and Alfred Egerton, and Lords Cherwell, Berkeley and Rayleigh all came to Winforton to relax - and work. Margaret Holland says: "Ostensibly they came to shoot grouse - that was the cover. But they were here for the laboratory as well." One particular scene sticks in her mind, that of the scientists mulling around and talking to each other in the middle of the huge Winforton lawn, where saplings have now taken root. Even on the coldest of days they would meet and converse there rather than in the house. She recalls in her puzzlement questioning the butler about this. "Walls have ears," he loftily replied. The real importance of the friendships Merton was forming became apparent when he was drafted in to advise various government ministries after the outbreak of war. . Not only had the help of his influential friends enabled Merton to force through his own ideas for the good of the country, but now he could become the champion of others, in the face of bureaucratic suspicion and resistance. As chairman of the Tribunal of Scientific Advisers to the Ministry of Supply, Merton was overseer of all inventions that came before it, and as such, an anonymous but key figure behind the development of the war's most glamorous invention the bouncing bomb. Week after week in 1942, Merton met Neville Barnes Wallis in London, and a close bond developed between the two. Twice Barnes-Wallis attended preliminary testing of the bouncing bomb including the dropping of dummy bombs, at a Welsh dam which resembled the Mohne - the Ruhr dam in Germany which was one of the ultimate targets. But here the records become temporarily rather thin. Why does Barnes Wallis' biographer vaguely tell us the dam is one Nant-y-Gro, Wales? And even more remarkable, why did Ministry of Defence experts give a reference for this "dam" which was a wooded slope in south-west Wales? Nant-y-Gro is in fact a tiny riverlet feeding the giant Caban Coch reservoir in the Elan Valley, where initial testing of the bouncing bomb took place in 1942. Still, given the closeness of his Herefordshire home, his position on the tribunal, and his friendship with Wallis, Merton would almost certainly have been present at the testing. John Evans well remembers his father returning home at all hours after driving Merton on "missions". When questioned by his young son, the chauffeur would give away nothing. This complies with orders given by Barnes-Wallis at the time, who became paranoid at the possibility of German agents discovering his plans; he even had the Secret Service investigate one of his own colleagues. But Wallis' fears were justified after a secret midnight swoop on a pub in the Usk village of Llangynidr had captured two enemy spies posing as an English army officer and his manservant. They had been staying at the pub - only 40 miles from the testing location - and were transmitting information to a source in Surrey, under cover of library books. The pensive mood of the time was reinforced with the knowledge that Hitler's deputy Rudolf Hess, was incarcerated in a former asylum near Abergavenny - only a few miles away. Throughout his detention, Hess believed that a plot was being conceived to take him back to his Fuhrer. In October 1945 he did indeed fly back to Germany on a De Haviland Rapide from the RAF airfield at Madley. But it was to Nuremberg and the Nazi war crime trials. It might be said that the bouncing bomb had a suitably explosive birth. Bitter personal feuding between Wallis and other scientists led to an almighty showdown. After a flaming row with the Vickers boss who wanted him "off the case," Wallis went to Merton for consolation. Only now did Merton realize the strength of the "enemy within" and begin to draw upon the resources of the alliances he had formed. He was a key figure in a scientific elite who fought to keep Wallis' plans alive. Ultimately Merton could have gone to the War Cabinet, or Churchill himself but had no need when Air Marshall Sir Arthur "Bomber" Harris came over to his camp - and the project survived. As for the rest, all is pretty well known and has been a staple ingredient in the diet of schoolboys since the smashing of the Mohne dam in May 1943. But perhaps in as the credits roll from now on, there will be a mention for the brilliant but retiring gentleman whose unremitting advocacy of the Wallis plans in the highest circles, alone brought them to realisation. When he wasn't busy changing the course of world history, Thomas Merton was a member of the Wye Board of Conservators, a Justice of the Peace (sitting on the Bredwardine bench)and a vice-president of the Hereford and District Angling Association. In 1939 he caught the second largest salmon ever taken from the Wye; naturally like all great catches records of the monster's weight vary from 54 to 63 lbs. Merton also became treasurer of The Royal Society for 17 years. Merton acquired art as well as offices, and was one of the few private collectors in the world to own two Boticellis. Margaret Holland remembers only being allowed to give the painting a whisk over with the feather duster. Mary Ann and I visited Mr. Weaver at the "Castleton" bungalow on Friday, 17 July 2009. Mr. Weaver purchased both "Castleton" and "Longhills" bungalows in 1984. His daughter resides in "Longhills". The bungalows are situated behind Winforton House, which was occupied by Professor Thomas Ralph Merton during the years when Barnes Wallis was conducting his experiments on the bouncing bomb. 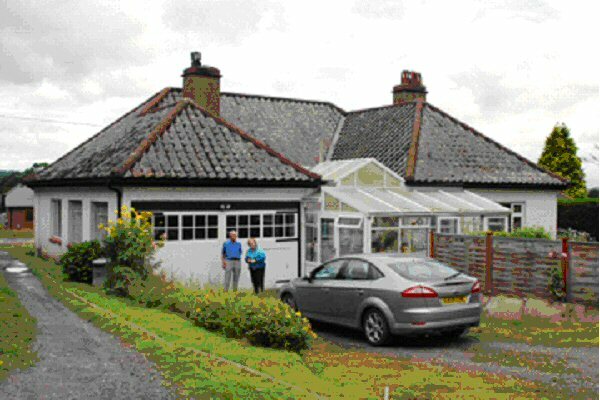 The main living quarters at "Castleton" occupy Merton's main laboratory area; the garage and guest bedroom in the bungalow occupy the area where the water tanks used by Barnes Wallis in his experiments once resided. Mr. Weaver will be 80 years of age in three weeks.